Who you choose as your friends says a lot about you -- specifically, that you're cool enough to actually choose your friends, as opposed to just latching on for life to whoever shares your particular views on cooties and/or offers you the tastiest glue. 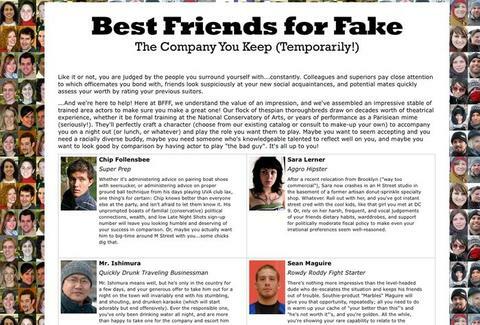 Giving you the buds that send the right message, if only for a day: Best Friends for Fake. Just launched by a pair of recent-ish Gtown grads, BFFF's a bizarrely conceived "social capital service" which'll rent you out a paid actor to stand in as your buddy and make a particular, agreed-upon impression for a night out/meeting/holiday etc; they schemed it up during a senior-year job hunt after "realizing the difficulty of making a memorable impression on your own", and apparently, of landing a real job. Employing an "impressive stable of trained area actors" of various races/ages/genders including a National Conservatory of Arts-trained thespian and a former Parisian street mime, they'll work with you to help solidify the particular niche-impression you need to make (from "responsible guy" to "wild chick magnet"), then pair you with the appropriate "friend" before letting you two haggle out pricing, which, considering the recent drop in cost of imaginary rope and man-sized boxes, should be pretty low. They've also got already-perfected characters who've received "glowing reviews", including "Chip Follensbee - Super Prep", whose boasts of UVA club lax will "will leave you looking humble and deserving of your success in comparison"; "Sara Lerner - Aggro Hipster", who'll give you "instant street cred with the cool kids, like that girl you met at DC 9"; and "Sean Maguire - Rowdy Roddy Fight Starter", a hot-headed pub-brawler who you can restrain to make yourself look comparatively responsible, or alternately, like a scared little vajayjay. BFFF's quick to disclaim that they guarantee only the quality of their actor's performance, and not any measurable result of said show -- something to keep in mind, as their performance will ultimately bounce off them and stick to you.